Distortion comes in a huge range of slightly different forms, from subtle analogue warmth to extreme metal fuzz, mild digital imprecision to eardrum-bursting clipping. But what is distortion, what's happening to your signal and why is some distortion 'good' while some is 'bad'? Theoretically, distortion refers to any form of processing which changes (or perhaps damages) the signal. In analogue gear, distortion usually arises when circuits are overloaded. Waveforms get squashed and 'clipped' as the peaks are flattened by the circuit's inability to reproduce higher levels. Imagine feeding a pure, clean sine wave through a distorted amplifier. As the level of distortion increases, the sine wave begins to square off. As the wave shape changes, so too does its harmonic content, introducing overtones or harmonics. Harmonics are whole multiples of the input signal frequency. Say our inputsignal is 40Hz, the even harmonics would be 2 x 40 = 80Hz, 4 x 40 = 160Hz and so on. Odd harmonics would be 3 x 40 = 120Hz, 5 x 40 = 200Hz and so on. Generally speaking, the even-order harmonics associated with valve distortion are perceived to be pleasant. Odd-order harmonics and inharmonic overtones are usually perceived to be unpleasant. However, as with all sounds, perception is subjective. If you think harsh digital clipping works well on your vocal, there's no reason not to give it a go. Distortion goes hand in hand withrule breaking. A lot of modern music - in particular the digital grunge of Dubstep - have truly embraced the once heinous notion of digital distortion. More specifically the distinctive sound of deliberately reducing the quality of digital audio. To understand what bitcrushing means, let's consider the difference between analogue and digital signals. The noises we hear are soundwaves - continuous signals made up of fluctuations in air pressure. Our eardrums convert these pressure changes to nerve impulses. A digital signal, such as that represented bythe data in your DAW, is slightly different. To make a digital audio recording, analogue signals - the outputs of microphones, analogue synths, and so on - must be converted to digital signals by your audio interface. This process involves an analogue to digital converter (ADC), which samples the incoming signal at a series of regular intervals and records its level at each sample point, creating a (hopefully accurate) approximation of the analogue wave which can then be processed by a computer. The accuracy of a digital signal is primarily determined by the sampling rate and bit depth of the ADC. The sampling rate refers to the frequency of the ADC's measurements. A sample rate of 192kHz, for example, means that the ADC samples the amplitude of the incoming single 192,000 times every second. Bit depth refers to the resolution of the recording method - 16-bit resolution allows the ADC to record up to 216 possible values (65,536) for the amplitude of the signal, while 24-bit resolution offers a total of 224 possible values (16,777,216). Clearly, higher sampling rates and higher bit depths give more accurate approximations of the signal. If all that's gone over your head, don't worry; bitcrushing itself is the easiest part. Bitcrushing (or its closely related cousin, sample rate reduction) is simply the process of reducing the accuracy of a digital signal. Let's say we've got a signal recorded at the audio CD standard 16-bit resolution and 44.1kHz sample rate. By reducing it to, say, 8-bit resolution or 22.05kHz sample rate, we discard some of the information. As a result, the signal becomes less accurate. The more information we discard, the more inaccurate the signal gets. Note, however, that we can bitcrush any digital signal, not just one which is based on a recording of an analogue input. The signal to be bitcrushed may only exist in the digital domain (for example, the output of a synth plug-in). Inaccurate digital signals are characterised by specific forms of distortion with decidedly digital sounds. By dramatically bitcrushing and reducing the sample rate of a signal we can induce all kinds of artifacts and frequency response in order to create everything from cold, clinical distortion to retro lo-fi effects. Back in the days of analogue recording, studio engineers had to be super careful about the level of signals heading for the tape machine. Too low, and the surface noise (hiss) of the tape would be obvious in the final mix. Too high, and a phenomenon known as saturation might occur. Saturation is an inherent flaw in the accuracy of magnetic tape as a recording medium. As the signal level increases, tape approaches a saturation point where no further signal can be recorded. 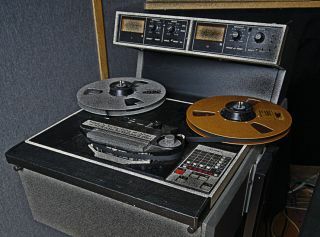 Unlike digital recording techniques, where analogue to digital converters in audio interfaces suddenly and aggressively 'clip' as the signal exceeds its maximum level, analogue tape breaks down in a less predictable manner. The result is distortion and compression which behaves in a non-linear way (that is, unevenly with regard to signal level, frequency and dynamic range). As luck would have it, tape saturation sounds pretty appealing to most people. Recording engineers realised that the pleasant distortion and compression characteristics of saturation could be used as a mix tool, making individual tracks sound more punchy, helping to 'glue' elements together and even making entire mixes sound bigger and louder. These days, the term saturation is used to refer to a variety of subtle, analogue-style distortion effects. Despite computers almost entirely wiping out tape machines, saturation effects can easily be created in your DAW. We like Voxengo's TapeBus (voxengo.com) and Massey's TapeHead Saturator (masseyplug-ins.com), but PSP Audioware's VintageWarmer2 has to be the champion of saturation effects. Combining tape-style distortion with single- and multi-band compression or limiting, this versatile plug-in can be used for anything from gently warming up an individual instrument track to smashing an entire mix beyond all recognition. It's available from pspaudioware.com for $149. A classic of the plug-in world.